Using the Australian Synchrotron, Melbourne researchers have revealed details of another key step in the process of programmed cell death, or apoptosis. Their findings will lead to the development of new ways to treat cancer and other diseases. Apoptosis is a crucial process in our bodies. When it doesn’t work properly, defective cells such as cancer cells can continue to live, or healthy cells can die unnecessarily, as may occur in Alzheimer’s disease. Mr Jason Brouwer, Dr Peter Czabotar, Dr Ruth Kluck and colleagues from the Walter and Eliza Hall Institute (WEHI) used the Synchrotron to discover exactly how a key protein called Bak changes to kick off the apoptosis process. They found that when Bak becomes ‘activated’, it changes shape and combines with another Bak molecule to form a ‘dimer’, which then initiates apoptosis. Their findings were published in the Molecular Cell journal. 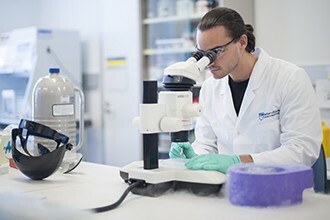 The Australian Synchotron is an essential tool for 21st century drug development and for structural biology studies that pave the way for drug development. The Synchrotron has two macromolecular crystallography (MX) beamlines that researchers use to investigate the precise details of important protein structures. The latest findings on apoptosis will help researchers develop new ways to treat diseases that include lupus, cancers and neurodegenerative diseases.